Engaging in conflict with people you dislike gives them power over you. You can't change the people that you can't stand, but you can change the way that you deal with them. Whether they are co-workers or in-laws, you probably have to continue interacting with them on a regular basis. By understanding why you dislike them, focusing on their positive traits, learning to contain yourself when you interact with them and knowing when to keep your distance, you will find it easier to deal with them. Pinpointing how people your buttons is the first step in dealing with them effectively. Ask yourself if your negative feelings toward them are in response to their behavior, past experiences or personality differences. Behavioral style is often the reason we like or dislike others, and we tend to like those who are similar to us and dislike those who are very different, says Beverly D. Flaxington, Certified Professional Behavioral Analyst, in her Psychology Today article "I Just Don't Like You." For example, if you are very outgoing, you might not like the introvert at the office because he always keeps to himself and doesn't join in on conversations. Compare your personality with the other person and determine what areas might cause you to clash. Note if other people also seem to have a problem with this person or if it's only you. Even though the people you dislike seem to have many flaws, they probably have many strengths you haven't discovered. Make an effort to find something to like about them. Try to look for a certain interest, hobby, or experience that you share with them. Ask people who seem to have a good relationship with the person that you don't like what it is that they like about him or her. Learn more about this person's life, background and family. You might find that knowing more about the people you don't like will open your eyes to their perspective or will lead you to empathize with them. Although it is easy to explode when dealing with someone who irritates you, doing so will only lead to more tension and negativity. Make every effort to keep your interactions with this person cordial and polite. When you start feeling anger and frustration taking over, you can try to regain self-control by such strategies as counting to 10, leaving the situation for a few minutes or taking a cold drink of water. If dealing with certain individuals seems to be robbing you of your energy and causing you stress, it's time to create a distance between you. Limit your interactions and only deal with them when it is absolutely necessary. Don't allow them to engage you in their negativity or conflict when you are around them. Practice visualization and relaxation strategies to keep them from infecting you with their negativity. 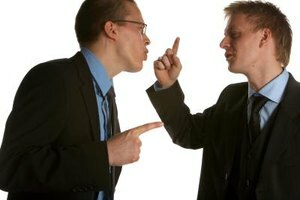 Imagine that you are "unhooked" from the person, or imagine that you are enveloped in white light and their negative energy bounces off of you without penetrating, recommends licensed psychotherapist Joyce Marter in her Psych Central article "How to Deal with Difficult People at Work."